So yesterday I told you how Lindsey from The Pleated Poppy saves my life on a daily basis. She could save yours too. The funny thing is, after knowing each other through our blogs for over a year we figured out that our husbands went to school together, and in fact their backyards faced each other as kids. Weird small world. Her eye for color, her fabric combos, her home, her family, her pictures.... I could go on and on. I love her blog. Love it. I love her shop. Love it. I could easily buy one of every single thing that she makes. Perhaps I already have. Multiple times. It is so wonderful to see someone dream big dreams, then live them out in such a beautiful way. She is generous, helpful, encouraging, and basically full of sunshine every single day. The world needs more Lindsey's. 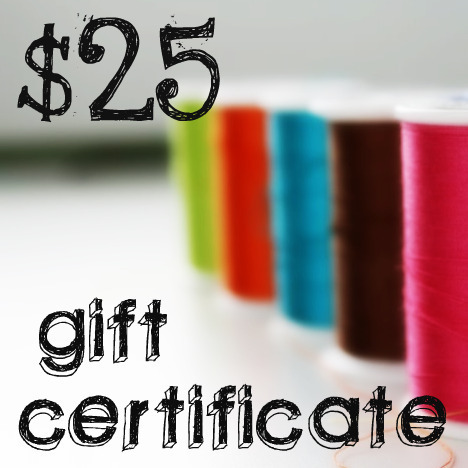 Lindsey is offering a $25 shop credit! Oh, the pretty that can be had for the happy, happy, winner. How could it be you? Come back here and leave a comment telling me your one must have item from the shop. Yes, I understand that is an impossible request. Do your best to narrow it down. A winner will be chosen at noon Pacific on Monday, July 19th. Oh man, I've been oogling her Petal Drop necklaces. So lovely. 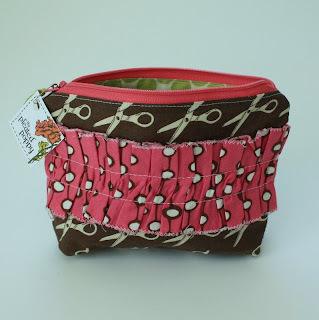 I am sure I could find a million uses for the adorable zippered pouches! I love #148! These are super cute! I love the zippered pouches, and those cute headbands or hair clips!! It'd be hard to choose just one! Definitely a petal drop necklace. Way cute! Her petal drop necklaces are beautiful!! I love Pleated Poppy and would love her posey pins, I have admired them for so long!!! Petal Drop Necklace, for sure! Thanks for the giveaway! i want one of her new sunnies cases. so so so much cuter then then one i have from the dollar store! I am in love with her beautiful her bloom bags. So feminine and fun! Loving the zippered pouches! Too cute! Love, love, love the new petal drop necklaces! I love her covered notebook, and her poppy headband, and her hero cape! How do you pick???????????? I really like the set of 3 posy pins. Oh I want a checkbook cover so bad! Thanks for the awesome giveaway. I love the zippered pouches. So cute and versatile. I hate lugging around a big purse for errands...one of these would be the perfect solution! #150 is my fav! Zippered pouch! So cut in the teal and red! either a zippered pouch or a covered notebook. probably the notebook--right now i'm writing down all my wedding planning in an ugly notebook and i'm wanting a prettier one! I love the zippered pouch 150 and 153. Love the fabric combos. I need a zippy pouch to carry all my bits and pieces in! I'd LOVE to get a petal drop necklace!!! 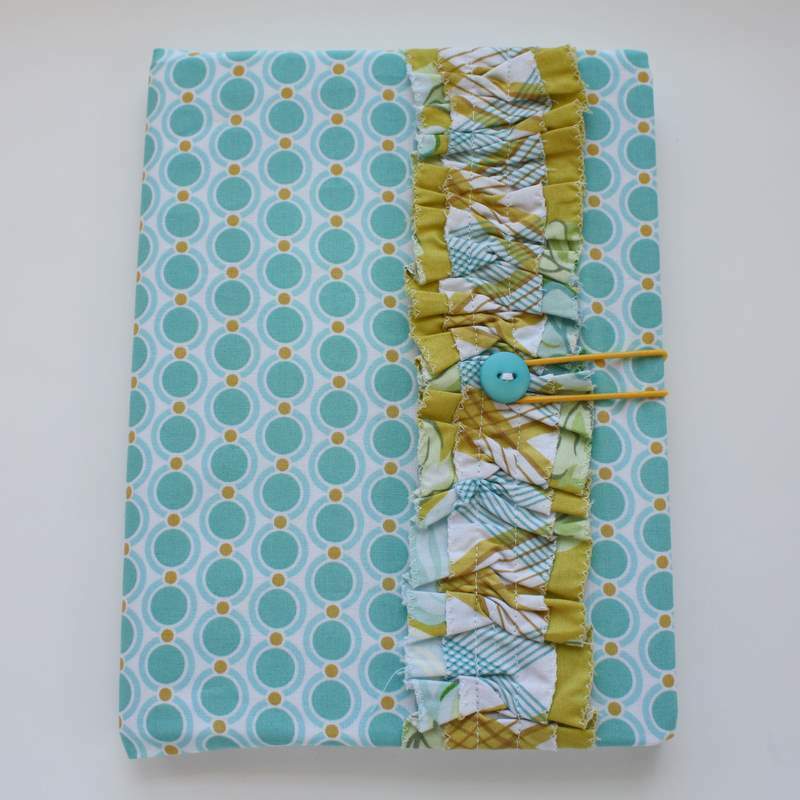 I love the covered notebooks-that Nicey Jane fabric and the ruffle? Adorable!! You were right when you said that it would be hard to choose. I decided that because I am a list-maker extraordinare, I would have to go with one of those cute notebooks!!! I would choose one of the turqoisey zippered bags! Such beautiful things. I was lucky enough to be at blog sugar and recieve a fabulous posey pin. I am extremely protective of it, like my girls can't even LOOK at it, because it's fabulous and I don't want to hear "oops...mom...sorry." If I had the wonderful chance to pick up another one of her creations, I would adore a zippered pouch. I love the petal drop necklaces and the capes, but with three little ones (twins that just turned two and a three month old) I really need some of those zippered pouches to keep all that STUFF organized every time we leave the house. ooh, one of the petal drop necklaces, for sure! thanks for the chance to win! What I want most though is a posie headband for my baby's noggin. and a petal drop necklace. I must have a zippered pouch! I love the beautiful fabrics! I love her posy headbands and hair clips! Maybe because I have 4 girls haha! Ohhh boy...it's a toughie...but I'm going to go with the crayon roll for my little girl. She's just starting to love coloring and writing and I've been meaning to make her one for a while now...and I never just do it. So, I'd probably go with that. The petal pushers, the posy pins, the necklaces, and the zipper pouches :) Is that narrowed enough - hehe! I need a posy headband for my little girl! I would get my son a super hero cape. He would love one! I just love #166- the posy hair clips.....they are so much fun & the colors are beautiful! I love the zippered pouches!!! so cute! SO hard to choose. Everything in her shop is adorable- I love her fabric choices! If I had to pick one, I think I'd go with the posy pins. What a great way to add some fun color to an outfit! I'm going to have to go with the zippered pouches...I could definitely use one (or a couple) of those. I love Lindsey's blog! Such a hard decision to pick one thing. But I'd have to say the covered notebooks are my #1 fave!! I really like the full apron. Too cute! I loooooove the pleated poppy! I follow her too! but I'd love a petal drop necklace... I thought I would love a zipper bag, but once I saw the necklace there was absolutely no turning back! Definitely love the necklaces... however, my son (and my daughter) would love one of those super cute capes even more! The zipper bag with the zippers all over it! I would love that! um, the zippered pouches? i need them. having my third kiddo next week, and i could put so many little things in it. love it. the posy pins! a seriously must have! Definitely a much-needed zipper pouch! No more rooting around in the bottom of the diaper bag for lippy/keys/phone/....! Oh man, everything is so gorgeous!! I'm drooling over here! I would LOVE a zippered pouch. #150 is so pretty! I would love this because ever since having my daughter I rarely carry a purse and it would be great for me to have some eye candy to carry my things in. For the last 6 months everything "pretty" i buy is for my little munchkin. Mommy needs some pretty too! Love your blog by the way! And thepleatedpoppy! I wish I had that kind of talent! I love the checkbookcover 63! well I LOVE all of Lindsey's stuff, especially all the ruffled zippys but i am so digging her drop necklaces right now. Holy Moly! How exciting! I love all of the new teardrop necklaces, but choosing just one would be impossible! It is hard to pick just one thing!! I really like the covered notebooks, especially 90. I love the posy headbeads!! they would look adorable on my sweet little girl!! Ooh! I LOVE the watermelon petal pusher and the covered notebook and the posy pins! :) too much cuteness! My favorite is the covered notebook. Love, Love, Love The Pleated Poppy! Her zipper pouches are my favorite! I LOVE the zipper pouch 156!! That's so unfair, but I can't do one...my absolute two favs (at the moment) are the new bloom bag and the sunnies case. Love her and YOU too! PS Hubby ka-winkie-dink, so funny! ooohhh! I really love the zippered pouch. I have thought of at least 3things I could put in it!! I'm in love with the petal drop necklaces!! My youngest daughter is so funny and scappy that she'd love the cape shirt. I love the pedal pushers - so cute! Thank you! Zipper Pouch 156... I am crushin' on the polka dots! Sorry, something is up w/ my computer?? Just zonked twice...ohhh man! The Petal Drop Necklaces are beautiful! Narrowing it down to one thing is hard! I probably would choose a zipper pouch, or maybe a new sunglass case, or maybe a petal pusher, or maybe some more posy pins. Hmmmmm. Too many choices! I love the pleated poppy! I already own some of her posy hair clips & a petal pusher. I just ordered a sunglasses case & can't wait for it to arrive! Next, I REALLY want one of her petal drop necklaces. Thanks for the giveaway! I love the zippered puch (# 154). VERY CUTE!!!! It was so hard to decide though! Well, I got one of those posy pins at BLOg Sugar and I wear it a LOT. I would like them in every color combo in my wardrobe. But I really, really, really love those capes. i want the star one for myself. Once, when I was nursing my youngest, and had quickly removed her from my breast and thrown my nursing cover behind my back to chase my 2 year old, someone came up to me and said, "Is that your cape?" Totally. Moms should wear capes. I'm loving her new items... the petal drop necklaces and the sunglasses cases... especially the mustard one with the sunnies print and houndstooth! I really love the Bloom Bag! I would use the gift card towards one of her adorable aprons. I already love to cook, but I could look retro-chic while doing it. What beautiful fabric she selects. I love all her stuff!! I think I would have to get a zippered pouch to hold all the small stuff that floats around the bottom of my purse/diaper bag. It's all adorable, but I think I'll have to go with zippered pouch #152. Super cute! Love Lindsey's stuff! My must have right now is the zippered pouch 148! Hope I win!!!!!!! So hard to decide! But, I think it'd have to be a Petal Drop necklace! I would choose the petal pusher...so cute! I love the zippered pouch 153 and like every single posy pin. I want to win...so bad..
Love, love, love the covered notebooks. LOVE. I love the little zippered pouch. It's perfect!! I love the petal drop necklaces, especially #38! LOVE!!! I would love the posie pins and the petal drop necklaces. Too cute! Love the poseys! The necklaces are beautiful too! DEFINITELY the petal pusher in watermelon. LOVE it! I have loved her bloom bags for quite sometime now - so those are still my favorite. However, the petal drop necklaces are also quite fetching (as well as everything else!). Thanks for having the giveaway! I heart the Posy Headbands. Cute! Love the grey notebook with the pretty ruffle! Okay, I really love anything from her with a ruffle. That means I love ALL of her creations! oh #166 posey clips have my name on them! The bloom bags are total my must-have! i love love LOVE the large pedal drop necklace, #29!! Petal pusher pin, petal drop necklace or ruffled hand towel. Great site. Thanks for sharing. the entire pleated poppy shop! LOVE IT! I especially love the zippered pouches..and the posy pins..what a great way to dress up a purse or scarf! They would also make great gifts for Christmas and birthdays! This is easy! I adore her posey hair clips. They are perfect! I love The pleated Poppy. That gift certificate would be awesome. I love her stuff! 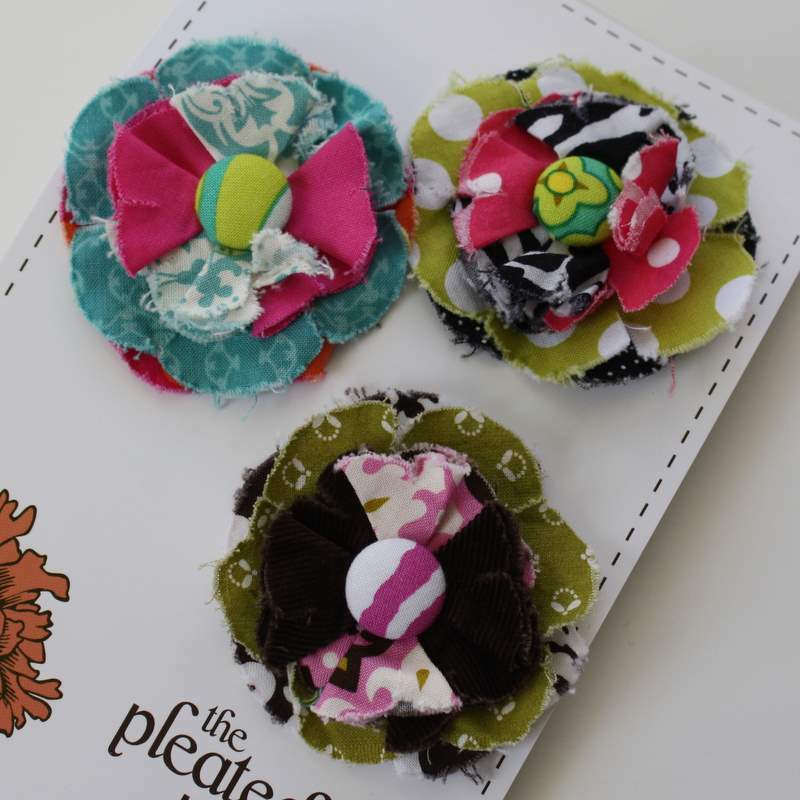 I'd go for a heather grey petal pusher for sure, and maybe the 453 set of poppy pins! Her necklaces are gorgeous but I especially LOVE her apple and raspberry apron!!! I've had my eye on one of her new necklaces since I read about them on her blog. And I loved the zippered/ruffle pouches. Decisions decisions. I'm in love with the posy hair clips...I so need to order some! IF I had to pick just one I would say the zippered pouch!! Love them all she does have a great eye for color!! I love the zippered pouches! I keep all of my things in pouches to make switching bags easier....*fingers crossed! * GREAT giveaway! i have been wanting the zipper pouch-147 for-e-ver! i love that scissors fabric! Hmmm, I really like checkbook cover 063. I don't think she has anything I don't like though! One must have item? My goodness, how to narrow it down? I guess I'd go with the bloom bag....so adorable!!! I'm loving the zippered pouches and the boys superman cape! I NEED one of those Petal Drop necklaces! Just beautiful! I love the zippered pouches! I like #148. So cute! I would have to have the Apron! SO cute. That was a tough choice! I would have to have one of her zippered pouches! So cute! I have been wanting one of her crayon rolls for my son for a long, long time! Let it be known that I am a huge fan of Lindsey Cheney. her blog ... the shop ... it's all good. very good. 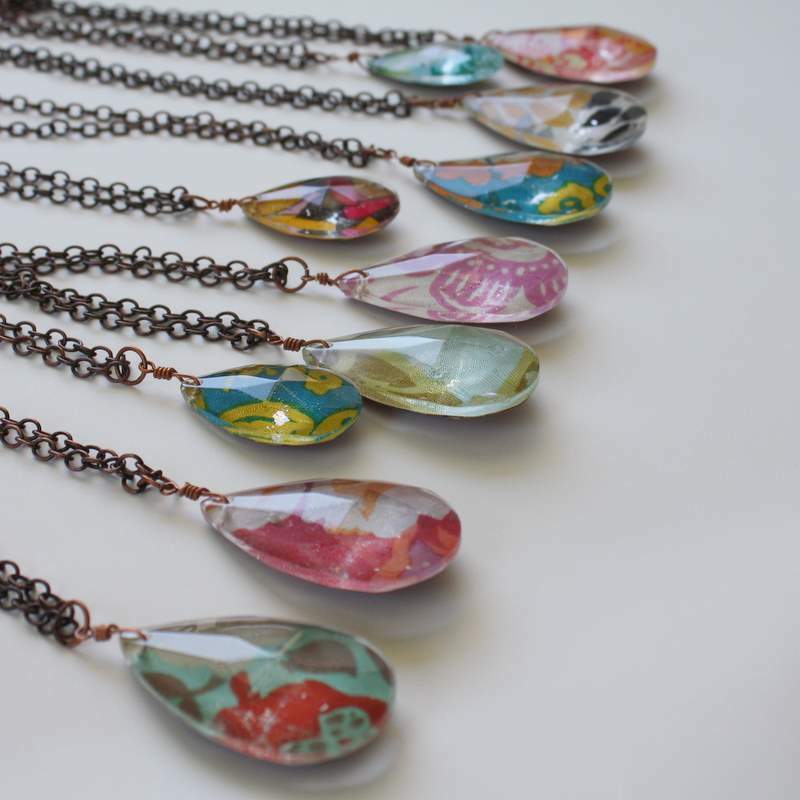 oh my the petal drop necklaces are selling fast. . .gotta have one! I love her necklaces! So adorable! I love the petal drop necklaces for sure! I love the zippered pouch- although I need several of them! I had never been on her website...absolutely LOVING her stuff! I'm loving the Petal Drop necklaces...go figure that all the ones I really like are marked sold...particularly #30...so gorgeous! I would love one of her zippered pouches. Things get lost so easily in my gigantic purse/diaper bag!! Oh I love her shop and her blog too!!! I've been eying her bloom bags and the posy pins. Love everything! Would love to have something from her shop! Really in love with the Petal Drop Necklace! :D I would wear it everyday! Oh, so many cute things! I'd LOVE covered notebook 87! I don't know how to choose!! I want everything!!!!!! I guess I would have to say my fav is probably the posy pins, they are sooo adorable!! I'd have to pick up the covered notebook - 86. I love the colors! Love the zippered pouches. and the posy pins. 'm loving the zippered pouches too though! I LOVE the zipper pouches, I secretly want 10 of them to organize every purse and diaper bag I own... I stalk her adorable store all the time. After the zipper pouches I want a flower headband for the baby and a crayon roll for the 3 year old. I love the posy headband and hair clips. So cute!! Love that all the hair clips are different. I love everything that has a posy on it. They are so cute! I want everything but I NEED a sunnies case. I am so bad about just throwing my glasses around. But if they had a cute home...Thanks! I liked the covered notebook 95. So pretty! I adore Lindsey and her shop! She is super sweet. Thanks to both of you for hosting this giveaway! Super exciting. I would love to have a notebook or a zippered pouch! or even a bloom bag. I could go crazy! Oh how I love the sunnies case #4. The colors are amazing - it calls me like it was made just for me! I cannot pick just one. The posy pins are to die for...and the the headbands are pretty darn cute too. I love the necklaces as well. I just cannot pick one. You can't make me. ;) I want it all. I love the petal pusher watermelon, so cute! I would look super cute ina a petal drop neckless! I really love the bloom bag, but it was already sold :( 2nd favorite is the Petal Drop necklaces. They could make a t-shirt look fancy! 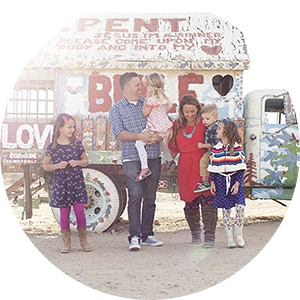 i recently discovered lindsey's blog and i am in love, too! and, after her recent blog about how her zippered pouches create organized goodness even in the messiest bag, then i have to say i need some zippies! 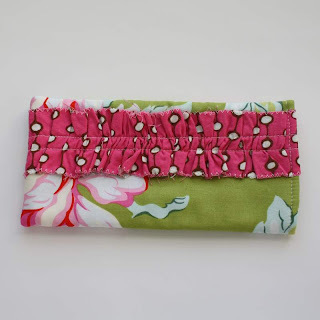 I am a huge Heather Bailey fanatic so my favorite is the zippered pouch 148! Beautiufl! I want want want one of her zippered pouches! 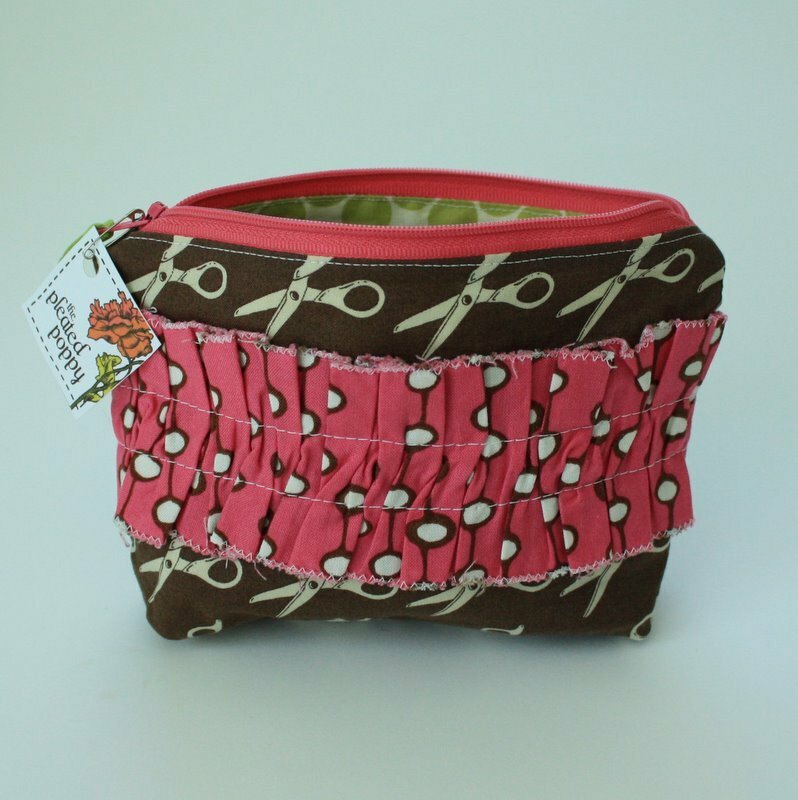 The zippered ruffled pouch with scissors...adorable! Only 1....Alrighty then, the petal drop necklaces. So cute!!!! Oh my word I love all of her stuff, but as I was looking the raspberries and apples apron really caught my butterflies!I love it!! Hope I get to get it! I love zippered pouch #150 and the posy hair clips #469. They would look adorable in my little girl's hair! I love the petal drop necklaces, zippered pouches, covered notebooks... could go on, and on! I love it all! Hey! I like the posy hair clips, for my daughter, of course! But, all her products are nice! Love the covered notebook #96 with the great green designs and contrasting ruffle. Just nice color combos-however can't say I would pass any of them up. Second choice would be a Petal drop necklace-any or all would be wonderful. Thanks for the chance!!!!! What cute stuff! For me it's a tough toss up between the black damaskish notebook and a sunnies case. I'd have to einie, meinie, minie, moe it. I would love the pins! Cute and great touch to a jean jacket! I have a purse from the pleated poppy...which I love! I would love one of the necklaces or the new sunglasses holders! Love her fabrics! I have my eye on another, yes another covered notebook in her shop. Must have posy pins ...LOVE them. But, really need a zippered pouch. and, oh, the petal pusher...would be so cute on just about everything i wear. my, the petal drop necklace...beautiful. guess i need to go shopping over at PLEATED POPPY, huh ?? I'd choose the 3 posey pins #452. So cute! I love her posy pins and her new sunnies cases! LOVE the zippered pouches. I am sure that I need like 5! I really love the zippered pouch. It's pretty awesome. What an adorable selection! I love the posey hairclips and zippered pouches. I love Lindsey's blog too! She is so fun! Thanks for the giveaway & my fav is the Covered Notebook-95! you can never have enough notebooks (esp. cute ones! :-)) Hope i win! thanks! I would love love love one of the new "sunnies"! I like the zippered pouches...I could probably use a dozen of them! The tough part would be deciding which fabric combo! I love the covered notebook-94. I have been looking for a new journal with some personality and these look like they'd be great. I just bought a petal drop necklace yesterday....I was so scared it would sell right away that I clicked the place order button before buying anything else!! AAGGHH!!! I would love some zippered pouches! !